A picture speaks a thousand words. But this one speaks a trillion. Can’t help but to put this tempting photo up. I don’t think I need to describe those brown squares. My, can you heart them calling out to you? If you’re just a sucker for chocolates like I am, I’m sure you wished you could have that box (from Mezza9, and yes i got to eat most of the chocolates you see there, i even kept the box) right in front of you right now. 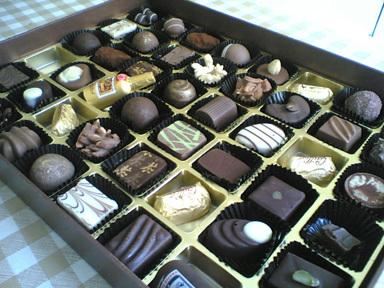 Chocolates always make my day. But my favourite type of chocolate is the dark one. Bittersweet, just the way I like it. Other versions like the milk chocolate have too much sugar and that spoils the true chocolate taste. All right, enough about chocolate already. I shall stop talking about it because I know I can’t have them now. Why so? That’s a very good question. Well let me give you a clue: I’m sitting at home, with swollen cheeks and my gums have been hurting all day yesterday. Easy Peasy huh? Yes, it’s my teeth. Or rather, my lack of it. All four of them. I extracted FOUR of my wisdom teeth yesterday. The procedure was painless but boy oh boy when the anesthetics wore off, my gums hurt so bad that I could do nothing but lie in bed. Tried going to sleep but couldn’t because it just hurt too much! I don’t think anyone could sleep through the pain. There’s only one word to describe the pain: Horrific. And I thought I wouldn’t have to go through such pain after extracting four other teeth for my braces. Geez. But I’m glad I was brave enough to not panic during the op. I feel like I can conquer the world! Haha. Ya rrrright. Sad thing is, for the next few days, I can only eat soft foods. Tragic huh? So for now, I can just console myself with food pictures. The following photos you’re about to see will let you in on what I really feel like eating. Ahh curry katsu don. Okay I know this picture doesn’t do justice to the dish (took it with my phone cam) but this is the only picture I have of jap curry. I recently became a huge fan of their sweet curry. Maybe it’s because I’ve always been eating spicy peranakan and Indian curry. This sweet version was a nice change. 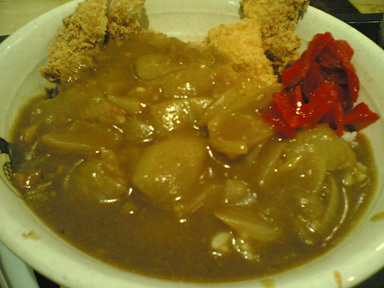 In case you were wondering, this curry katsu don was from Sanuki Udon at Scott’s shopping centre’s food court. They also sell hand made udon which i have yet to try. will definitely go back for the udon. Had actually planned to go to Curry Favor at City Hall today with some friends but have postponed it because of my teeth. Yea, this restaurant serves the best jap curries. It’s been featured in many magazines and newspapers. I can’t wait to go there. Hopefully by next week, I can taste the sweet thick brown gravy. MMmmm I’m salivating now. Sashimi. Very very raw fish. Weird thing is, I used to cringe at the thought of eating raw fish. But now, it’s one of my favourites. 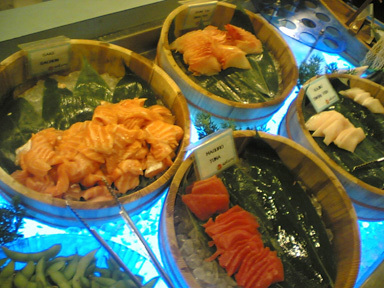 Damn I wish I could go to Japan right now and taste their freshest tuna and salmon etc. The freshness will please me so. This picture was taken at a buffet. Sakura i think. Well the buffet is pretty reasonable: $24nett for dinner. I say it’s money well spent. heh they serve international food too, aside from the jap stuff. The one I went to was at Tampines Safra. 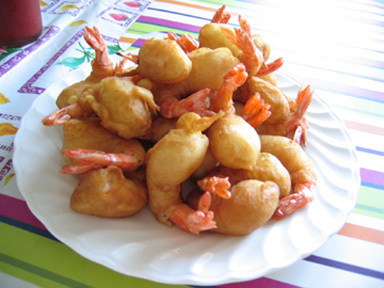 The prawn fritters and the turkey are my dad’s handiwork. Don’t they look delicious? 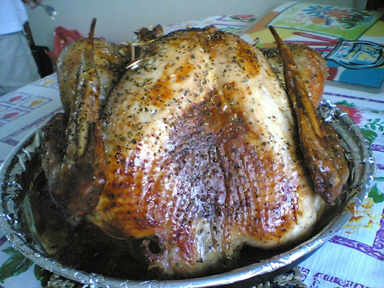 Yea, the turkey was for Christmas last year. But had to put it up. Why? Because I’m so proud of him! My dad is an amazing chef. He cooks so darn well! I really wish he could pass down all his skills to me. He did work as a cook before… at various restaurants like Blue Ginger, Tony Roma’s, Mandarin Hotel etc. But I think what he cooks best is still pure simple Peranakan fare. My dad’s peranakan and yes he can cook a mean ayam buah keluak, devil curry, babi pongteh, sambal assam prawns, otah. I really think he makes up for my mum’s lack of culinary skills. Dad’s actually about ¼ Indian (his grandpa was Indian) so I guess that’s a good reason why his curries are so amazing? Hahaa okay no correlation whatsoever, but still…. I think my dad’s amazing. I think it was because of him that I wanted to be a cook. Well, of course I’m still gonna be writing. I’ll be a writing cook! Whatever that means. Speaking of writing and cooking. I remembered I had the opportunity of helping to write for a cookbook last year. The experience was amazing. Everything was done from scratch including the photography. I helped with the food styling too. It was an eye opener. The cookbook turned out great and so did the pictures. Most of the recipes in it are Peranakan. You know what, I really should start practicing my peranakan cooking skills. I must master the ayam buah keluak one day. Boy do I love the smoky taste of the black Indonesian nut that’s in the dish. Okay, once my gums are properly healed, I’m gonna conquer the world. I’ll be trying out some Peranakan recipes and yes, continue baking. That’s quite a list I think. Well once I’ve whipped them up, I’ll be sure to share pictures with you and let you drool. Meanwhile, I’m also coming up with the menu for my 21st birthday soiree in July so if you have any suggestions or any recipes that would work perfect in a birthday kind of setting, holler ya. Till then, bon appetit and thank your lucky stars that you’re not in pain right now…..
Hello ms baker, I wanna try making the pizza dough~ is strong plain flour just means normal plain flour? Hello Ms baker, I just baked a loaf of bread and it turned out fab! Im gonna try yr pizza recipe soon! Its perhaps the easiest recipe ard for pizza dough~ hehe thanx! Oh yes…i am going to go get dry yeast today! hehe. I love japanese curry. Have you tried Yokohama Romankan at the taka basement? It’s good! Hope your gums will stop hurting soon! yes i’m feeling much better. Just that I look as if someone punched me. Swollen cheeks. Hi michelle, what bread did you bake? post up pictures of it! yea the pizza dough recipe is seriously easy. i was quite surprised at how easy it was. I feel like using it to make some dessert pizza next. Ya know with chocolate and banana topping. YUM! No, i haven’t tried their jap curry. But i’ve heard it’s good. Oh boy I have to try it when my gums have healed then. Hahaa.. gosh the list of things to try when i’m better is really getting longer! ya.. chocolates are god’s greatest gift to mankind! you tried Valrhona? it’s french dark choc and the same one Beard Papa uses for their fondant chocolat thing. But really you should try Bakerzin warm chocolate cake! you won’t regret.